Stay At Home Mamma: Thank You! Thank you all so very much for your thoughts and prayers for our wee Max. He has improved so rapidly that we can go home tomorrow! Whoop!! He's now off the oxygen, the nasal tube is about to be taken out (which means I can breastfeed him again - HURRAH!) and his breathing is back to normal. 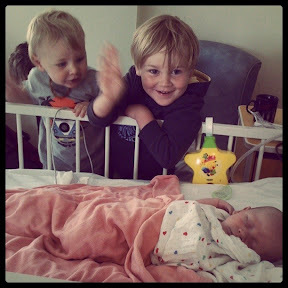 Austin has been an absolute LEGEND husband and father and has been taking care of the 'home front', including dealing with and caring for the other two boys who have been sick and grumpy with lots of snot. Not to mention Aunty Gretchen who dropped everything to come out and help on the day Max went into hospital. And then there's the numerous friends who are our surrogate London family who offer to look after Luca and Beni so Austin can come to the hospital or simply to give him a *break*, and offer to bring round meals. And then there's God who is always so faithful. I know He is looking after our little family, even though we are on the other side of the world to our families and I know they have been VERY frustrated they couldn't simply jump in the car and be here to help in a matter if minutes. Still, I am confident in my God who holds our little family in His hands. I know He takes care of us, in the big things and the small. I'm so keen to get back to normal life at home. No more hospital stays for a while thank you very much! LOVE! THANKFUL! let's us hear from you when you are home and settled. sweet baby. Thank you God. That is an awesome list of love you have going there - so good to set our eyes on the good stuff when things are hard. So pleased your little man is recovering rapidly! Take it easy at home!